What will I need to prove? What if I already have permanent residence or ILR? What if I am Irish? What does the application look like in real life? How long until I get a decision? Can I get help with the application? I have started an application for a document certifying permanent residence. Should I still apply or should I wait for the new system to come into place? It is increasingly hard to predict whether or not the UK will exit the European Union with a deal. But the government did publish, back in December, a plan for the rights of EU citizens living in the UK if there is no Brexit deal. According to the plan, the government would continue to run what it calls the EU Settlement Scheme. 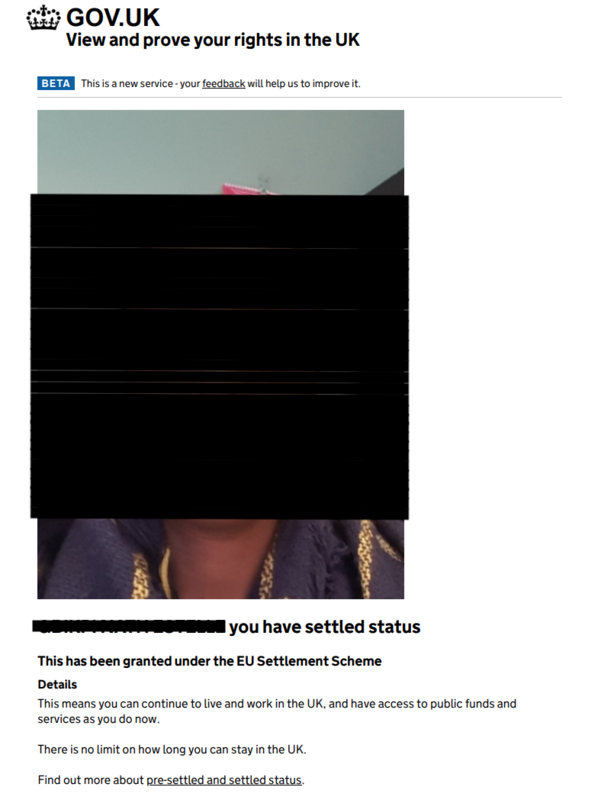 This is a system for granting EU citizens “settled status” in the UK that was drawn up following negotiations with the European Commission. 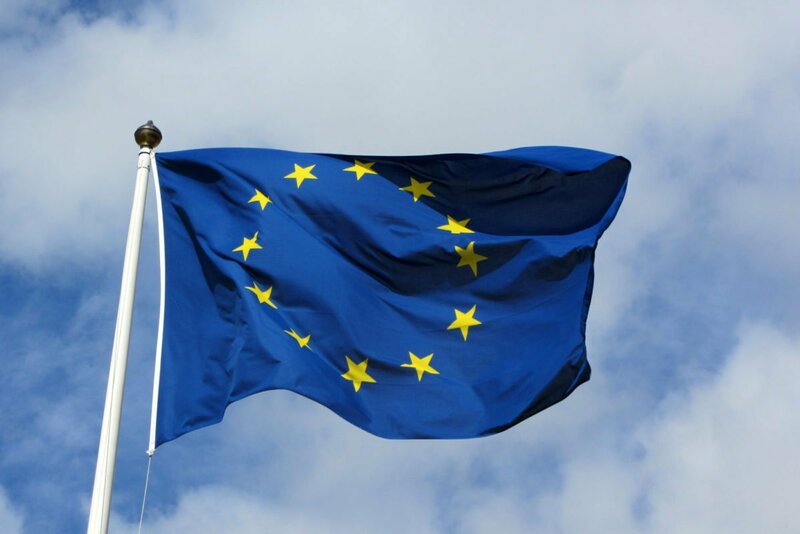 EU citizens and any of their non-EU family members who, by 29 March 2019, have been continuously resident in the UK for five years will be eligible for “settled status” enabling them to stay indefinitely. EU citizens and their family members who arrive by 29 March 2019, but will not yet have been continuously resident here for five years, will be eligible for “pre-settled status”. This allows them to stay until they have reached the five-year threshold. They can then also apply for settled status. EU citizens and their family members with settled status or pre-settled status will have the same access as they currently do to healthcare, pensions and other benefits in the UK. Close family members (a spouse, civil partner, durable partner, dependent child or grandchild, and dependent parent or grandparent) living overseas will still be able to join an EU citizen resident here until 29 March 2022. This is so long as the relationship existed on the date of Brexit. Future children are also protected. The dates given in the summary above apply in the event of no deal. If there is a deal, the scheme will cover EU citizens who arrive by 31 December 2020, rather than 29 March 2019. You can read about the other differences in this post. Either way, a vital feature of this arrangement for the 3.5 million or so EU citizens living in Britain is that they are not protected by it unless they make an online application to the Home Office under the Settlement Scheme. Failing to apply will mean that they end up with no legal right to live and work in this country. The Windrush generation can testify that being undocumented in “compliant environment” Britain is no fun at all. The EU Settlement Scheme is underpinned by a set of administrative rules, published on 20 July 2018, called “Appendix EU”. Appendix EU is where the detailed rules on the Settlement Scheme are found. It is not easy reading for non-lawyers, though, so this post tries to explain what the rules are and how the scheme works. The Settlement Scheme involves entering some personal details via a Home Office smartphone app and then filling in an online form. There is help available for people who can’t use the app or need help using the internet, which I’ll cover later on. But most people will be expected to use the app and complete the online form. The ID checking app seems to still not be working on Apple devices. Apple users will need to borrow Android devices. The system has been designed to be much easier than a typical immigration application. The existing application for “permanent residence” as an EU citizen notoriously involves an 85-page form and evidence of what the applicant has been doing in the UK. “Settled status” is largely based on proving residence in the UK and the application system has been streamlined. The system will check existing government databases for proof of residence, for example. My personal experience was that there are some technical hiccups with the system at the moment, but most people should find the application reasonably easy. I expect that people who are vulnerable in some way and/or have less evidence of their past residence in the UK — e.g. if they have never worked or accessed benefits — may struggle more with an application and need help. The results of an initial pilot of the scheme in 2018 were promising, with a 100% success rate. The results of the second pilot were more concerning, in particular for those applicants who do not have “straightforward applications”. The application system will be fully open to all by 30 March 2019. In the meantime, however, it has been tested by some eligible applicants in three phases. The first phase of the implementation of the scheme, “Private Beta 1”, ran from 28 August to 17 October 2018; the second phase, Private Beta 2, ran from 1 November to 28 December 2018; while the third and final “public phase” of the testing opened on 21 January 2019. The public phase of testing is open to all European citizens resident in the UK who have a valid biometric passport. Non-EU family members of EU citizens who have a valid biometric residence card can also apply. So this is quite some “test” — potentially millions of people are now eligible to apply. Potential applicants may wish to consider that the online system may improve between now and 30 March. Applications made between 21 January and 30 March 2019 will also have to be paid for, but refunded, whereas applications after 30 March 2019 will be entirely free. More detail on this below. Every EU national and their family will need to make an application before the deadline of 30 June 2021 (or, if the UK leaves without a deal, before 31 December 2020). People who may want to apply earlier rather than later include non-EU family members of EU nationals whose current documents will expire while the settled status process is open. They may want to get a settled status document, rather than renewing their existing documents, to use for things like proving to employers, landlords and banks their right to live and work in the UK. Otherwise, family members will end up getting an old-style EU residence document and then having to switch onto settled status — they might as well go straight onto settled status once it becomes available. 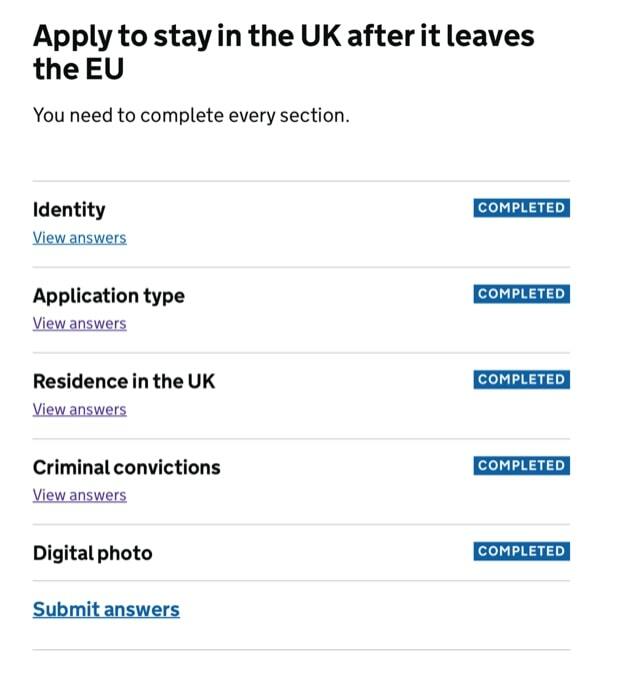 On the other hand, those who have not yet reached the five years but will by 30 June 2021 (or 31 December 2020 in the event of a no deal) may want to wait until the five-year anniversary of their residence in the UK to apply. If not, they will be granted pre-settled status first, and will then need to make a second application for settled status once they have reached the five-year mark. Applicants will be able to provide evidence of their identity and nationality by uploading a passport or valid national identity card digitally via a smartphone app. 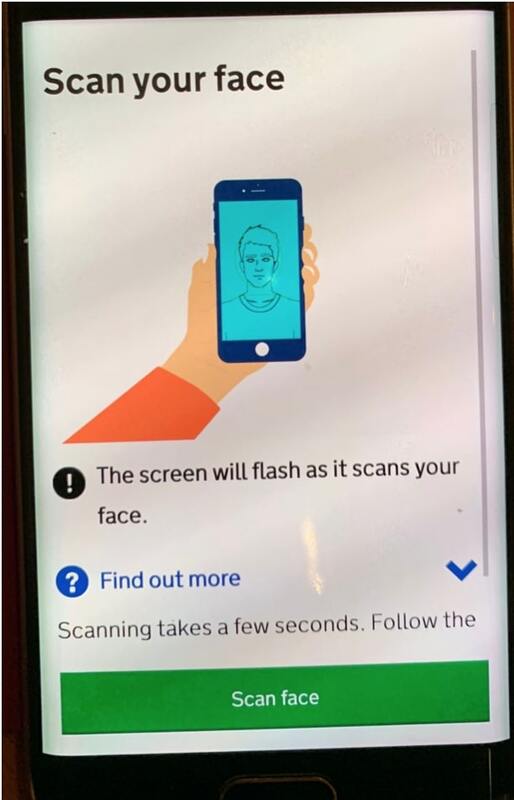 This will only work if the passport or card is a biometric document with a chip (indicated by a rectangular gold symbol that looks like a camera). Once the scheme is fully open, those who do not have a biometric document may send the documents by post instead. The identity document will be returned to the applicant “as soon as [the Home Office] can”, and presumably even before a decision has been made. The Home Office may accept alternative evidence of identity where an applicant is unable to produce a passport or ID card “due to circumstances beyond their control or to compelling practical or compassionate reasons”. Applicants will also need to “enrol their facial image” (i.e. provide a photo of themselves). Those applying for settled status will need to show five years continuous residence in the UK. Those applying for pre-settled status will need to show current residence in the UK. Under Appendix EU, continuous residence simply means having lived, or living, in the UK. The definition of “qualifying period” at Annex 1 of Appendix EU makes no reference to “exercising Treaty Rights”. This means that EU nationals will not need to show that they have been working, studying or held Comprehensive Health Insurance (a big issue for many people refused permanent residence documents in the past). In terms of evidence, the default position will be for the applicant to simply give their National Insurance Number. The Home Office will carry out automated checks of data held by Her Majesty Revenue and Customs (HMRC) and the Department for Work and Pension (DWP). Those checks should show evidence of employment and receipt of benefits, which will indicate residence. If the checks indicate that the applicant has been continuously resident in the UK for a period of five years, they will be granted settled status. Of course, not everyone will have data with HMRC or DWP (for example, those who have never worked or received benefits). This Annex provides non-exhaustive lists of the type of documentary evidence which the applicant will be able to provide. The guidance below is not prescriptive or definitive. Some applicants may lack documentary evidence in their own name for various reasons; you must work flexibly with applicants to help them evidence their continuous residence in the UK by the best means available to them. When lawyers talk about “family members” in this context, we mean non-EU citizens whose right to be in the UK depends on their family relationship with an EU citizen. If you are French and married to an Italian, you can both apply as I’ve described above. Whereas if you are Nigerian and married to an Italian, you can also apply under the Settlement Scheme, but the process will be slightly different. You can find a detailed list of which family members are eligible for the scheme at Annex 1 of Appendix EU. Family members of EU nationals may decide to apply for their new status at the same time as their EU citizen husband or mother or whoever it might be. 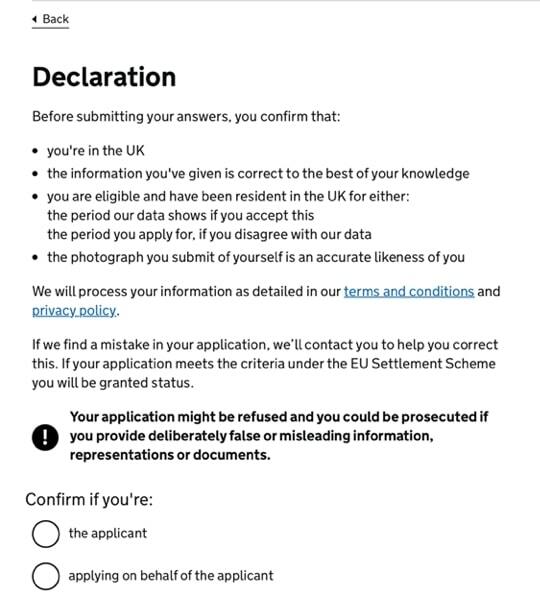 The Home Office website encourages this, stating “You’ll probably get a decision more quickly if you apply at the same time as or after your family member.” Family members will need to prove, through the same documents as above, the EU national’s identity and residence in the UK, although “evidence of the EU citizen having been granted status under the scheme will be sufficient evidence of the person’s identity, nationality and continuous residence”. Some EU citizens and their families may have what is called “permanent residence” — a technical legal term in this context — under EU law as it exists today and have a document to prove it. Similarly, EU citizens who have lived in the UK since before 2006 may have a document or stamp in their passport confirming “indefinite leave to remain” in the UK. Those who have previously been issued a permanent residence document must still apply under the Settlement Scheme. Those who have indefinite leave to remain in the UK may apply, but do not have to. These applicants will not have to provide further evidence of residence, but will be subject to criminality and security checks (see below). The Home Office will also need to confirm that their permanent residence status has not lapsed through absence of more than five consecutive years; or indefinite leave to remain has not lapsed through absence of more than two consecutive years. The applicant will simply need to “self-declare” that they have not been absent for that period of time. If the Home Office is satisfied “on the balance of probabilities”, that the applicant meets this requirement, they will be eligible for settled status. There will be criminality and security checks. Applicants will self-declare their criminal convictions (without having to submit evidence). In addition, though, the Home Office will carry out its own checks through the Police National Computer and the Warnings Index. The government says that it will only refuse to grant settled or pre-settled status if you are “a serious or persistent criminal, a threat to national security, or have a deportation order, exclusion order, exclusion decision or removal decision against you”. This will not affect most people but there is more information in the official guidance. Appendix EU also contains rules on refusal on the basis of “suitability”. In addition, under Rule EU16, caseworkers may (i.e. they do not have to, unlike Rule EU15) refuse an application. This can be done where “false or misleading information, representations or documents have been submitted (including false or misleading information submitted to any person to obtain a document used in support of the application)” that is “material to the decision”. EU16 can also be used to refuse settled status where the applicant is subject to a removal decision under the EEA Regulations. Any decision made under Rule EU16 must be “proportionate”. Irish citizens will not be required to apply under the scheme (but “they may do so if they wish”). The intention is that nothing changes for them, in immigration terms, because of Brexit. Their family members who are not Irish or British will need to obtain status under the scheme, unless they have an independent right to live here under UK immigration law. They will be able to obtain settled status even if the Irish citizen does not apply for it. The scheme was originally going to cost £65 for adults. But on the same day that the scheme was open to the public, 21 January, Theresa May announced she would scrap the fees. Applications under the EU Settlement Scheme will, therefore, be free. However, there doesn’t seem to have been enough time to change the online application system, which was geared up to require payment. Therefore applicants applying under the current test phase up to 30 March are asked to pay up front and promised a refund. 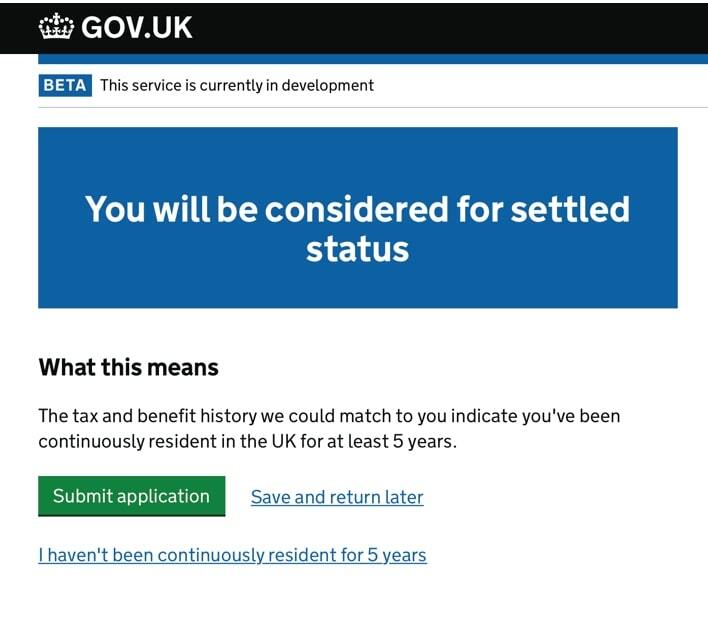 After 30 March 2019, nobody should be asked to pay for settled status. 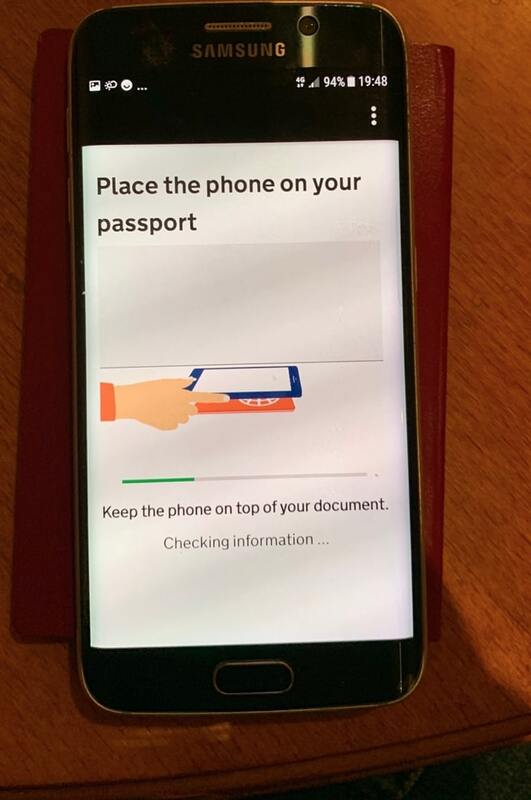 The first step is to download the EU Exit: ID Document Check app. As mentioned, this will only work on Android smartphones. Below are photographs of what shows up on the app during each of those four steps. Once the applicant has entered their details in the app, they will be directed to a web page to continue the application. They will need to log in using some personal information and the phone number/email address given previously. The “identity” and “digital photo” sections will show up as “completed” already, because that is done via the app. The applicant will need to fill in the sections on “application type”, “residence in the UK” and “criminal convictions”. For most people, this won’t take very long. 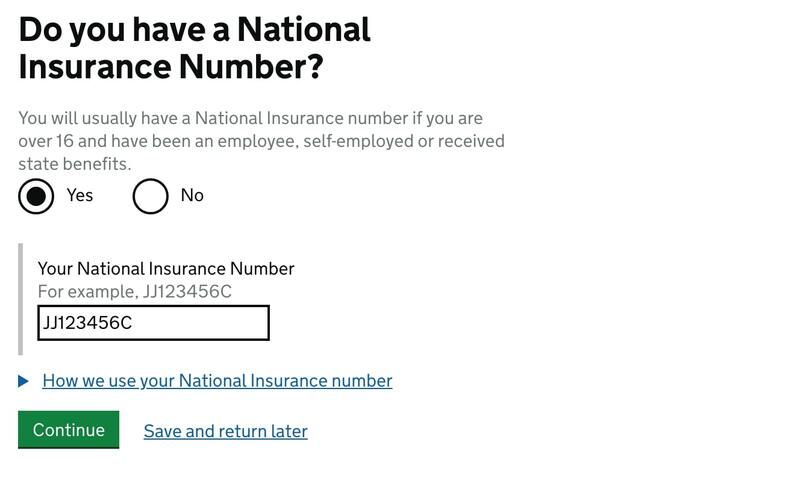 An important element of this part of the application is submitting a national insurance number, if the person has one. The Home Office will use this to automatically scan government databases to see if they have existing records of the person paying taxes or receiving benefits. If they exist, that will serve as proof of residence, so the applicant doesn’t have to submit their own evidence. 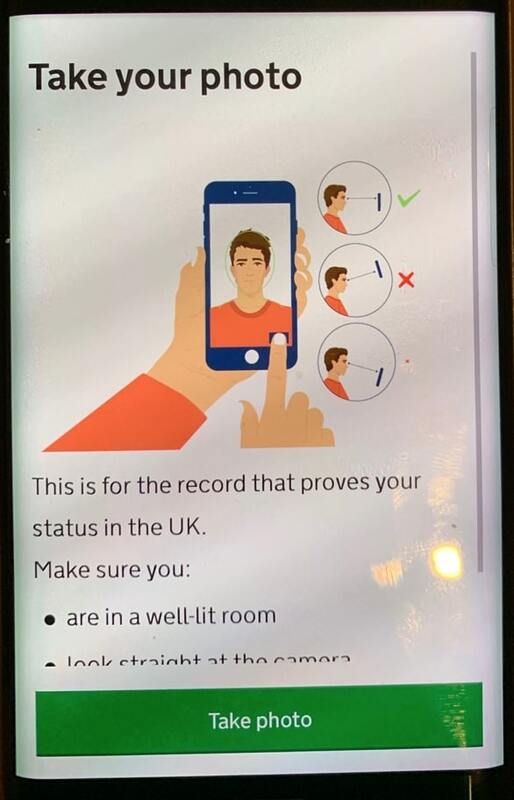 This will show up if the automated scan of government data shows that the applicant has been living in the UK for a continuous five-year period. All that remains is for the application to go to a human decision-maker to sign off on the decision to grant settled status. The EU citizen will have a choice between “accepting” pre-settled status, or submitting evidence to show that they acquired settled status. If EU citizen applicant selects that they want to show they are eligible for settled status they can view the years they need to provide evidence for and upload evidence of residence. This will happen if the data shows continuous residence of less than five years, but not in the last six months. 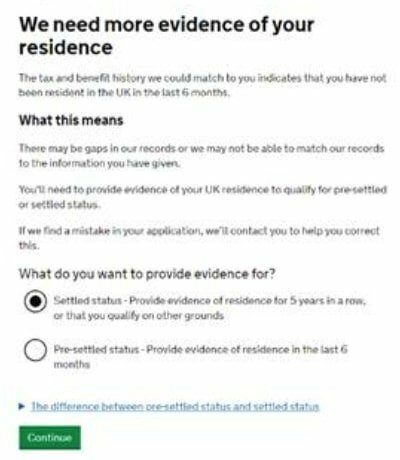 Applicants can then decide to upload evidence showing their residence for five years (to be eligible for settled status) or for the last six months (to be eligible for pre-settled status). This will also happen if there is no data showing any residence at all. Again, applicants can then decide to upload evidence for five years or six months. 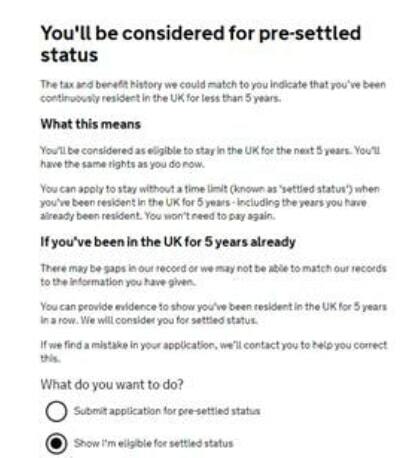 If you believe that you should get settled status, and have evidence to demonstrate it, then you shouldn’t accept to be given pre-settled status, or you will need to submit a second application for settled status in the future. Applicants then receive a Certificate of Application. You can see what mine looks like below. Once a decision has been made, applicants will receive a decision by email – see below. This explains that their pre-settled or settled status in the UK can be confirmed online through the Home Office online checking service: ‘View and Prove your Rights in the UK’. Free Movement’s deputy editor, CJ McKinney, has recorded a screencast of a settled status application. It is embedded below. The report on Private Beta 2, mentioned above, said that 69% of successful applications were decided within three working days and 81% within a week. Straightforward applications, for example where an applicant already has a document certifying permanent residence, can take as little as one hour. However, those who are asked to submit additional documents should expect to wait longer. Expected processing times should have been published online starting from November 2018, but the website still says “current expected processing times will start to be published on this page shortly”. You can make an appointment at one of the 13 locations offering ID document scanning. It costs £14. The Home Office says that once the scheme is fully open in March, there will be 50 such locations, and an option to post your passport away for scanning. You can get advice online or face to face through the Assisted Digital service. 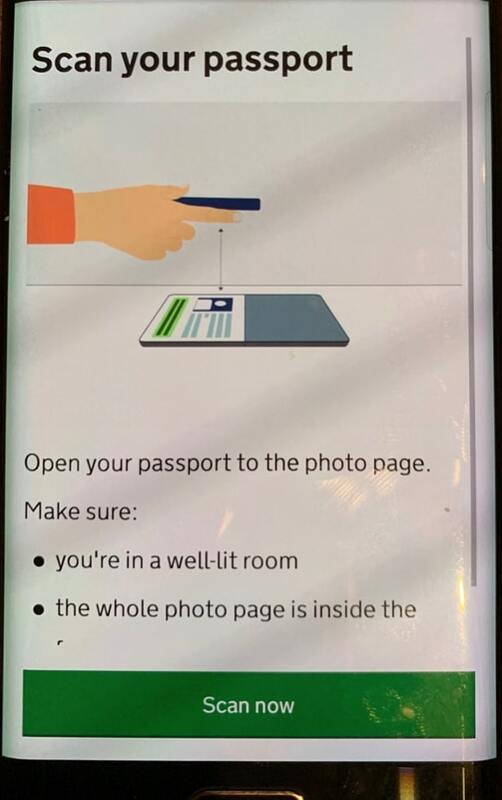 However, you will need to have scanned your ID already. If you do not have an Android phone, you will first need to attend an appointment at one of the locations above, and then book an appointment for the Assisted Digital Service. Use the EU Settlement Scheme contact form to get help online. The first point to note is that, if an application is incomplete and a caseworker thinks that it can be easily rectified, they should contact applicants and give them a reasonable opportunity to submit supplementary evidence. That said, if the application is refused, the remedy will depend on when the application was made and whether the UK exits with a deal. Those who apply before the coming into force of the Brexit withdrawal agreement on 30 March 2019 will have a right to an administrative review, unless the refusal is made on “suitability grounds”, in which case it seems the only redress will be judicial review. Those applying for administrative reviews are, to put it simply, asking Home Office caseworkers to double check the decision. The rules relating to these administrative reviews can be found in Appendix AR (EU)of the Immigration Rules. the applicant shall have access to judicial and, where appropriate, administrative redress procedures in the host State against any decision refusing to grant the residence status. The redress procedures shall allow for an examination of the legality of the decision, as well as of the facts and circumstances on which the proposed decision is based. Such redress procedures shall ensure that the decision is not disproportionate. A person refused status under the scheme before 31 December 2020 may also make a further application under the scheme at any point before then. A technical note of November 2017 confirms that those who have been refused will “be able to remain in the UK pending conclusion of the appeals process, unless a deportation decision is made, or the individual is in the UK in breach of a deportation or exclusion order”. That group might be removed before their appeal is heard, although they will be able to apply to return to the UK to attend their appeal hearing. If you intend to apply for British citizenship, you might as well continue with your permanent residence application. This is because you will need to show that you acquired permanent residence one year before the date of your application for British citizenship (unless you are the spouse of a British citizen, in which case you will simply need to show that you have permanent residence). If you wait until the new system comes into place, you will need to wait 12 months after being granted settled status to apply for British citizenship, irrespective of how long you have lived in the UK. 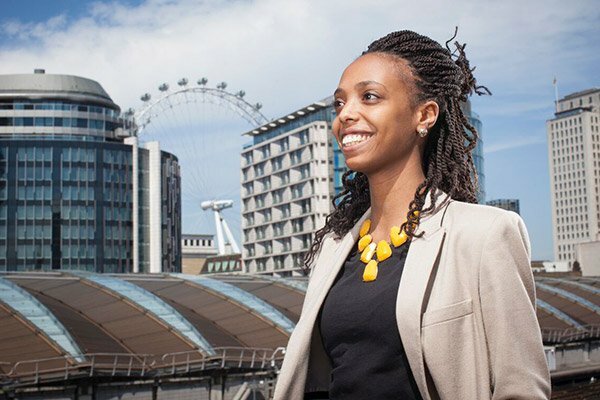 Full guide to the requirements and process for naturalising as a British citizen, including where the Home Office will show flexibility and where not. Case studies included throughout. You might also want to do the permanent residence application given that, once you have the document certifying permanent residence, switching to settled status will be free and easier. You may also want to avoid the rush of three million people applying for settled status once the new system comes in. On the other hand, those who do not have a straightforward application for a document certifying permanent residence, for example because they have been students during the five-year qualifying period but did not have Comprehensive Sickness Insurance, would be well advised to wait for the new system, where they will no longer be asked to show insurance. This article was originally written in January 2018 and has been updated to take account of developments since.